On December 22, 2017, President Trump signed into law the “Tax Cuts and Jobs Act” bringing about numerous changes to the current tax law. The Act dramatically changes many tax provisions for individual and business taxpayers, including reducing tax rates, reducing or eliminating some deductions, while increasing or adding others, and changes to various credits and the alternative minimum tax (AMT). The following is a recap of some of those changes. 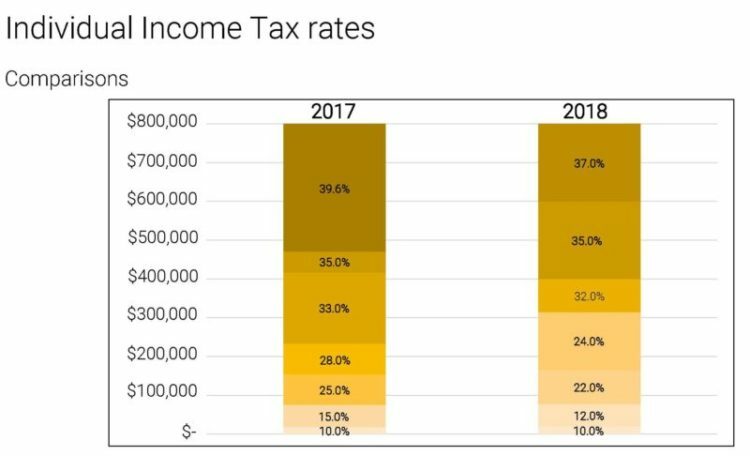 The tax brackets have been compressed and the top rate is set at 37%, down from 39.6%. The standard deduction is increased to $24,000 for MFJ taxpayers, $18,000 for HOH and $12,000 for all others. Itemized Deductions have been simplified (i.e. some are limited or outright eliminated). SALT Deduction $10,000 maximum deduction for income taxes, property taxes, sales taxes, and DMV fees. Mortgage Interest Deduction Limited to interest on up to $750,000 for new acquisition indebtedness; Repeals deduction for home equity indebtedness not used to improve your home. Charitable Contributions Percentage Limit increased from 50% to 60% (for cash). Personal Casualty Losses Repealed, except for declared disasters. Medical Expenses Expanded for two years by setting the deduction threshold to 7.5% of AGI for all taxpayers. Deductions Miscellaneous itemized deductions repealed, including employee business expenses, union dues, tax preparation fees, investment advisory fees. Alimony Paid Repealed for any divorce or separate instrument executed after 12/31/18. The Child Care Credit has been expanded. The AMT exemption increased from $86,200 to $109,400 for MFJ taxpayers, but is subject to phase-out at higher income levels. The Obamacare “shared responsibility payment” is eliminated for taxpayers who do not have health insurance after 2017. For divorce agreements finalized after December 31, 2018, alimony is no longer deductible by the payer or taxable to the recipient. Section 529 Educational Plans may be used for elementary and high school qualifying expenses, including those for homeschool up to $10,000 per year. 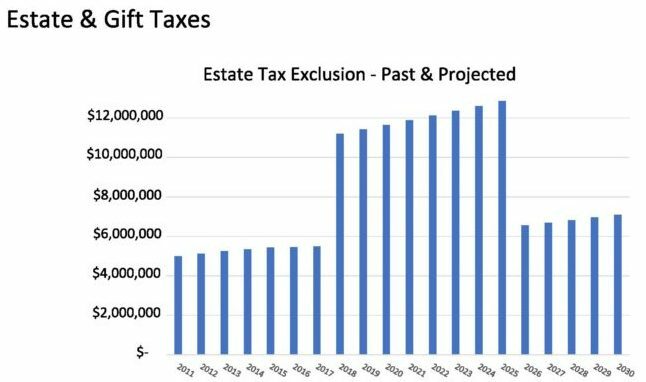 The estate and gift tax exclusion is doubled from the original $5,000,000 to $10,000,000, indexed for inflation. The annual gift tax exclusion is raised to $15,000 beginning in 2018. The maximum gift tax rate is 35%. The Act expands the list of assets not eligible to receive capital gain treatment. These include patents, inventions, models or designs and secret formulas or processes which are held by the taxpayer who created the property. There is a new deduction for non-corporate taxpayers for qualified business income (QBI) related to the “business pass-though deduction”. Deduction equal to 20% of domestic “qualified business income” (QBI) from a pass-through entity. Basically, provides an effective top marginal rate of 29.6%. Applies to trusts & estates. 25% of W-2 Wages plus 2.5% of unadjusted cost basis of assets. Unavailable to Specified Service Business owner’s taxable income in excess of $415,000 (MFJ). Limitations phased-in from $315,000 – $415,000 (MFJ) of taxable income. The final version includes new statutory language to exclude architects and engineers from the §199A Specified Service Business definition. Farmers receiving income from cooperative can get a deduction of 20% of the total income received from the cooperative, limited in some situations. “Carried interests” (certain partnership interests acquired for service) must now be held for three years to receive long-term capital gain treatment. If you have any specific questions about these provisions of the Act, or any other questions, please contact us at Bowman & Company, LLP (209) 473-1040.